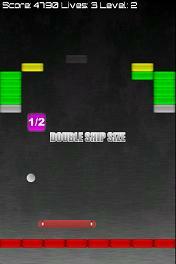 The Brickening is another Arkanoid style game. I view it as a "no frills" version of the Android game Galaxy Breakout because it's just a plain and simple breakout game with power-ups. There's no story... there's not even any "flvaor text" like Arkanoid had. You're just pounding away at bricks in level after level, but that's ok because this game has a trick or two of its own up its sleeve. First the basics. There's a paddle that you control at the bottom of the screen. There are four kinds of bricks: red, yellow, green, and steel. The steel ones can't be destroyed, but the red, yellow, and green ones take 1, 2 and 3 hits to destroy and as you hit them they color degrade so you can keep track of how many hits are left. I'm a bit intrigued by the color order as in the USA generally red means stop, yellow means yield, and green means go so I'd have expected green to be one hit and so forth. 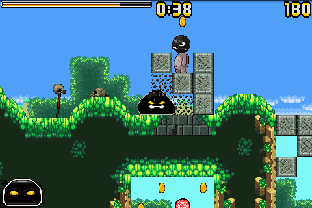 The game includes 100 levels and a level editor so that you can upload/download levels with other users. Hopefully that will take off, but I suspect that will need to be more of an author supported thing. The graphics are basic and the sound adequate. The two real nice things about this game, though, are how smooth it plays (I have not seen a game where the paddle tracks as close to my finger as well as it does here and given the importance of control in a game that's a pretty big deal) and that the author was clever enough to provide some space where I can place my finger for moving the paddle BELOW the play area. No longer am I blocking my view of the game with my giant hand. 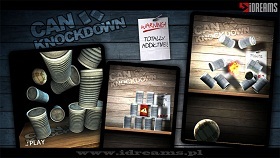 The game also features a full bevy of power-ups: +3 balls, laser cannon, sticky paddle, barricade (a layer of bricks below you paddle to make that extra save), ...etc. I was particularly impressed when I got a +3 balls power-up followed by another +3 balls so I had 7 or so balls on the screen at once for about a tenth of a second. Let's just say it's hard to keep track of that many balls and that it was quite a rush. This game is well worth a buck. 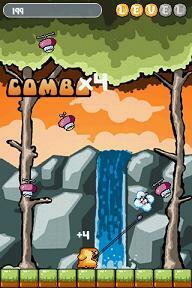 There are plenty of levels and the game plays so smoothly that I really enjoyed it. I've never been too big on story modes in these kids of games anyway... they always seem a bit convoluted. This game is all about the action and takes a step back towards the genre's successful roots in the game Breakout while leaving in the goodness that is power-ups. 4/5 stars. There is also a demo version in the Android Market that is available now. Air Hockey isn't exactly the cleverest name for a game that I've seen, but I guess it makes it easy to figure out what this game is. It's air hockey on your Android and features one or two player action and not much more. Loading Air Hockey brings you to a screen... 'one player', 'bonus two player', or 'visit our web site'. First I tried the one player mode. The way this works is that you start off with a basic ranking and as you play against the AI opponent you'll either gain or lose ranking until you reach a point where the AI is challenging. The graphics are basic and the audio sounds like a real air hockey table does (but don't think the music in the video below is actually in the real game). You hold down on your paddle with a finger and drag it around the screen swatting and blocking the puck. Early advancement is pretty easy and one nice thing about computer Air Hockey is that it enforces the rule that says you can't move your paddle over the middle line. Next, my youngster was bored in a restaurant the other night so I broke out Air Hockey to play. The controls were horrible on her side. Her paddle would frequently stick around the middle line and it would take many seconds for it to become free again. I have to think this has something to do with the game or my Droid not handling multi-touch very well, but, interestingly enough, my paddle had no issues... it was just hers. Needless to say the thrill wore off all too quickly and she was soon playing Care Bears Memory Match by herself. My bigger problem with Air Hockey isn't even Air Hockey's fault. It's the simple fact that playing this with two players is a pain on such a tiny screen. Even with one player it's less than thrilling. 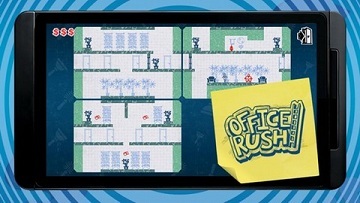 This is a game born for the upcoming Android tablets. Conclusion? This review feels short because there's not much to Air Hockey. It's only a buck so it won't break the bank, but at the same time I just don't see coming back to it. There are many other Air Hockey games in the Android Market and I'd love to hear feedback if you've found one you think stands out. As for this one, I'd give it a 3/5. 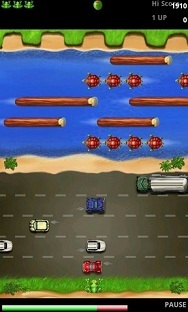 If you don't know anything of this game then here it is a nutshell. You and up to 3 competitors are on an island made of hexagons. Each hexagon sports one of five resource types on it with the exception of a single, dormant desert hex. One the vertices you place settlements and cities. On the edges you place roads. Each hex also has a number from 2-12 placed on it. 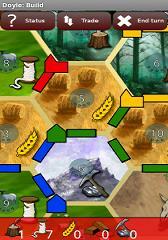 On each turn a pair of dice is rolled and any hex assigned that number produces its resource type. If you have a settlement next to it you produce one of that type of good and if you have a city you produce two of that resource. These resources are used to buy more things: settlements, cities, cards, and roads. The game ends when a player reaches 10 points which comes from settlements, cities, having the longest road, the largest army (cards), and extra points (cards). Island Settlers (you were wondering if I was actually going to talk about it, weren't you?) brings this game to Android and allows you to play with several AI opponents or in hot seat mode where you pass you phone to the active player. It also includes a few variants such as allowing you to change how many points it takes to win. The graphics are passable look great with today's update and the sound is rarely worth talking about when it comes to board game conversions. The controls work well as the game gives you an overview of the entire island and allows you to easily zoom in for more precise placements of roads and structures. It also cleanly points out available locations which I guess I don't like as much as part of the game should be about spotting good locations without help. Perhaps that should be an option. The game claims basic AI. The game is right. The AI just isn't very good, at all. My first game finished with me easily winning and two opponents left with 2 points (and you start the game with 2 points so that equates to no progress) and the third opponents with 5. I'm a pretty good, but not great, Catan player. The XBox 360 version of Catan provides me with a challenge. This AI is nothing more than training wheels for learning how to play. Still, the game is free and this isn't a bad way to learn. If you're going to play against a friend then go buy the real game (it's available at Target, now) after you've tried this and found out that you like it. Sure it'll set you back $40, but this game really is that good and just maybe it'll open you open you up to the massive world of games that exist outside of Target and WalMart. I'm sure the AI has to be on the short list for a future update and network play would be another means of addressing the lack of challenge. At least until the 'cease and desist' letter arrives and an official Catan game is released on Android. There was a Catan game in the Apple App Store until the 'real' Catan arrived so I'm fully expecting a repeat of that scenario. It's almost as if they waited to pull the clone so iPhone owners wouldn't be left without their Catan fix, though. 3.5/5 stars mainly because the AI provides little longevity for the solo experience. Dominion in a nutshell is played as follows: There are 3 basic types of cards... money cards that let you buy other cards, point cards the dilute your deck as they don't do anything until scoring at the game's end, and other cards that you play in order to do more or better things during your turn. You start with 7 copper cards which are worth 1 money unit and 3 point cards. You shuffle your deck and on every turn you draw 5 cards. Can't draw? Shuffle your discards and continue. Your first hand will therefore have some money and some points in it. Once again... points are worthless until the game is over when they become the only thing that matters. So you'll use your money to buy a card. On your turn you get 1 action and 1 buy. Other cards can give you more actions, money, and buys (among other things) so you might buy a card that gives you an extra action and 2 more coppers. Purchased cards go into your discard pile as does your current hand and you draw for the next turn. The player with the most points at the end of the game wins. If you want more detail than that click on the title to go to Andromion's website and you will find links to the full rules. Androminion isn't going to win any beauty contests. 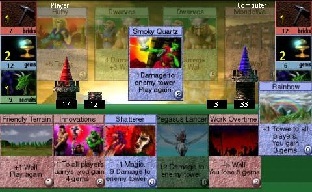 The screen is plain with available cards listed in rectangles along the top of the screen. It does include help and you can touch and hold on any of the cards to see what they do. Still, I would prefer to play the real card game not only for the social element, but also so I can quickly scan what my cards say. I guess advanced players have many of these cards memorized, but I do not. Androminion randomly chooses the set of cards you'll be playing with and forces a 3 player game upon you with two AI players. AI? Yes, this free game has AI that is actually pretty good. The rules seem to be solidly implemented and the touch interface of tapping on cards works and is done well enough to avoid any accidental plays. In other words, when choosing a card you have to select and then click select once the card is 'highlighted'. Androminion has plenty of opportunity for improvement as all of the hard work in terms of getting all of those pesky rules functioning is done. It would be nice to be able to play with 2 or 4 players, network play, the ability to choose which cards I'm going to play with, and, I'm obligated to say, a UI upgrade with pretty cards. I don't know the legality of this game, but I see the publisher (Rio Grande Games) is given full credit. Is it possible they'd allow for the actual card graphics to be used? This is a dream come true for Dominion fans. If you enjoy Dominion then this won't let you down. It's probably not going to replace human competition, but it's nice to be able to practice and try out new stuff against competent AI. Likewise, if you like turn based, strategy games you really ought to check this out. Finally, if you like this game then please buy the original paper version. This is actually a really good family game, too. I've provided a link above that offers Dominion from Amazon.com at a pretty good price with free shipping. And what is there to prevent you from trying this game out on your phone? Nothing as it's free!! 4.5/5 stars. We've seen several of the Apple App Store's high profile games make the leap to Android recently. 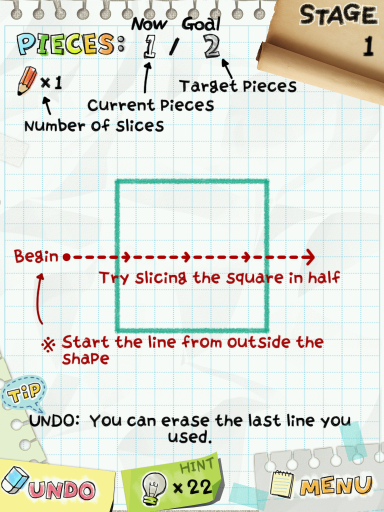 I'm talking about titles such as Angry Birds and Doodle Jump. Now it appears that FireMint's Flight Control will be making the jump. There are countless clones of this game in the Android Market already, but I'd be all over the original assuming the price is right. And, in case you're wondering what it takes to make this list the game has to, of course, be cheaper than it was since I last posted about sales and have a 3 or more star average rating in the Market. No junk allowed! Archmage has an immediate resemblance to Magic: The Gathering, and regardless of whether you like or hate the concept of a game with a principle business goal of making the cards you've already purchased obsolete you have to admire the core concept and influence that this game has had. The idea of a minimal set of rules in which each card breaks those rules and provides the owning player with an advantage has been used and reused. Archmage's similarity to Magic ends with two dueling forces competing in a turn based strategy card game as its cards don't really break rules. In fact, this game is much simpler and lighter than Magic. On each side of the screen are three areas with a color, an icon, and two numbers in them. These areas are you quarries, your magic, and your dungeon. The big number is the number of units of each of these your earn per turn. The little number is how many of each of the associated resources (bricks, gems, and recruits) you currently have. You use these resources to pay for cards. A green card with a 15 in the lower right costs 15 green (recruits) to play. Damage to you or your opponent's tower or wall are basically understood, but damage that doesn't specify a target is not. 'Damage' by itself simply means it hits the wall first and the tower second. If you don't have enough resources to play ANY of your cards you are forced to discard a card. Discarding (which is covered) is done by dragging a card down instead of up the screen. Ok, now that we've got that out of the way we can talk about game play. The core strategy behind this kind of game is maximizing your resources to get the most "bang for your buck" to be cliche. An example of that might be playing a card that does 8 damage to your opponent's tower and costs you 4 gems. If you play such a card when you only have 1 gem you can't lose what you don't have (and you don't go negative) so playing such a card when you have few gems is a good idea. Likewise, building your resources generators early so that you can play better cards later is a good thing, too (i.e. it would be better to add 1 to your quarry that gain 5 bricks as it will pay for itself in 5 turns). The games graphics are pretty good and the audio is up to snuff for a card game. The controls are entirely touch screen based, and I did have the occasional issue with it not recognizing a card drag when it should. You'll want to make sure you understand the rules to the game as the game doesn't allow you to use cards you can't afford. You won't want to think that has happened when it's just that your touch was not recognized. I'm ultimately a bit disappointed with this game mostly because my expectations were so high as I hurried to download what I thought was a Magic: The Gathering like game. If you anticipate that then you'll be disappointed too. This is a light strategy game. I think often it's obvious what you'll want to do. In a nutshell, each card just changes a few numbers around until one of those numbers is either 100 or 0 in which case the game is over. The fantasy theme isn't necessary, but it's nice. And the game is a nice, light strategy card game with a fantasy theme. There is a 'lite' version in the Android Market to try before you buy which I'd recommend first. 3.5/5 stars. The game can be summarized as being an action exploration game in the same manner as Metroid, Castevania or Aquaria. The true goal in the game is to uncover the cause of the disease which is plaguing the mother tree. To progress through the forest you will need to collect new abilities, cure diseases that stands in your way as well as collect hidden powerups. The Gameplay is comparable to a traditional shooter but with the freedom of flying. Using your accelerometer or thumb to guide Spirit through the forest adds exciting new gameplay in a whole new dimension. Flick Kick Football features three main modes of play in addition to a practice mode. They are arcade mode where you take shots until you miss, bullseye mode where you not only have to put the ball in the net you are also aiming at various bulls eye targets, and a time attack mode where you score as many goals as you can in a minute. 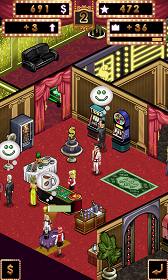 Each of these modes has a bit more to it than that such as arcade mode allowing you to earn extra lives (i.e. misses) and having the goal potentially defended by several cardboard cutout soccer players. The cardboard cutout thing is actually kind of neat as when you plink one with the ball it gracefully topples. 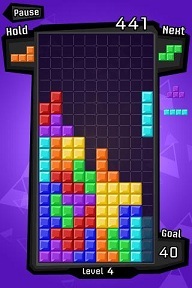 The game, as with other Pik Pok titles, features Open Feint support for sharing and comparing scores with other players. The graphics are comparable to Flick Kick Field Goal and the sound is great with a crowd cheering, good 'ball contact' sounds, ..etc. There's plenty of similarity to the field goal version of the game so what's different? Well, obviously you're kicking into a net that has a top. You can overpower the ball and send it sailing too high. The big difference, though, is the kicking. There's no wind to worry about, but instead you have the ability to curve your flick and have the ball curve around any defending players. Don't pay attention to those negative app store reviews... this does work and I don't know if other users are having problems on low end hardware or what (and this review was done on a Motorola Droid so hardly top of the line hardware as of today). The curving is kind of interesting as it can be challenging to control. I will say that when I don't need it I avoid using it. A straight kick has proven far more reliable. However, as the game's difficulty progresses you'll need to weave a shot through some defenders here and there and thus learn to excel with those curve shots. 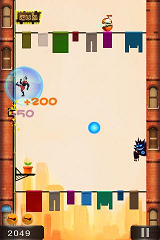 Pik Pok has easily captured the crown respect to flick kicking games. Should I be expecting Flick Shot Hockey soon? That I don't know. Should you get this game? That depends on your love of flicking a ball at a goal. If you've got the field goal game and play it extensively (as I do) this will easily be a dollar well spent. 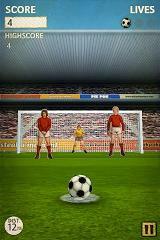 If you don't yet own a Flick Kick game then I can't see too many people going wrong with such an addition. If you've got one of them and aren't totally enamored with the idea then you can probably skip acquiring more. This is a 5/5 star title that shares a substantial amount with its cousins, but not everything. And at the dollar price tag it's a winner. The bad news is that, after releasing some of the best games in the Android Market, Polarbit's quality has been a bit shaky. The good news is that Reckless Racing piggybacks on their initial trend of top notch games. I've tried a few top down race games on the Android and have never really come away as impressed. Reckless Racing changes that and is a keeper. It's simple... Reckless Racing is a top down racing game (meaning that your perspective is as if you are flying overhead looking straight down at the track). The game features three modes of play in single player mode called Dirt Rally (a straight up race), Hot Lap (race solo for the fastest time possible), and Delivery (pickup and deliver). Once you've selected all of your options you start the race. The graphics are very pretty with dirt roads, bridges, puddles to splash through, cones to knock over, ...etc. The environment has lots of stuff to knock around. Couple this with some appropriate, deep south banjo music and, as much as I hate banjo music, the game sound great. When controlling your car you have three options... two touch screen layouts and a tilt option. I played mainly with the touch screen choices as that felt good and I'm already tilting my phone back and forth a bit as I wind around the tracks. The touch screen controls are tight and I didn't have any issues maneuvering around tight turns. The game also features network play and leader boards along with a variety of cars and tracks. One thing that would have been cool, given the graphics and physics engines they have built this game around, would have been a demolition derby mode. I love demolition derbies and have to admit that it was almost as much fun ramming into the other cars and seeing the sparks fly as it was crossing the finish line first. If you're interested in top down racing games and the southern theme isn't a turn off then I have no doubt that Reckless Racing is for you. At $2.99 it's a more than fairly priced game that I'm enjoying a lot. I wish I could direct those that are still questionable to a demo version, but there isn't one at present. However I do have a video of the game below. 4.5/5 stars for the best top down racer in the Android Market that I've played. Simplicity. Often the simple games can be the best. No complex rules... no complex controls... just challenging game play. A game in which you know you're improving even when your performance in each game isn't necessarily superior to the last is a key ingredient to addiction. I think City Jump hits much of this formula and that leads to a very satisfying gaming experience. And it's free. City Jump's premise is simple. You're a super hero (with the original intent of being Superman based on various clues in the game) scaling the walls of buildings on your way to ward off danger. Several obstacles stand in your way. This is best illustrated in the screen shot. In essence there's a building on the left and on the right of the screen. You're on one of the two sides (on the left in the screen shot) and can jump back and forth between them. As you scale the walls you are vulnerable to enemies. When jumping you are also attacking and can smash through and eliminate enemies for points. Should you eliminate three identical enemies in a row you power up and become invulnerable for a short period of time racking up even more points. Sounds easy, but it's hard. 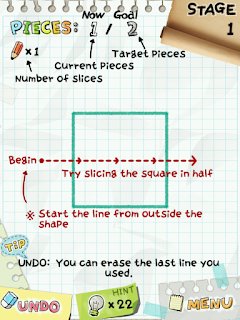 This actually reminds me of a simplified Doodle Jump that doesn't lose any of the fun in the conversion. The graphics are pretty good and the frantic music that plays along with the drop off upon your demise are excellent and really add to the mood of the game. Even better... controls consist of simply tapping the screen when you want to jump. This is a game you can play in one hand with your thumb. As stated the game is free as in 'ad supported'. There aren't a lot any options for customizing your experience in terms of difficulty or anything and no, this isn't a game I play for hours on end. But this is a game I've been coming back to several times a day for more abuse. Conclusion? I love it. This would be well worth $.99, yet it doesn't cost a thing. The advertising that pays for it is unobtrusive, and it's an ideal mobile "pick up anytime you've got a minute or two to play" game. Go get it! I'm a software developer by trade and when I worked my first job we'd always make fun of the marketing guys as "do nothings". We'd hear of them going golfing or out to nice dinners with clients and think "That's work?". Here I am 15 years later with a completely different understanding that marketing isn't just work... it's hard work! It's just different from what I was doing. And maybe that's why the marketing guys would make fun of us for sitting around playing with our computers while thinking thoughts similar to those that we had. 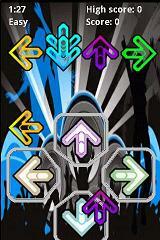 Finger Dance Devolution is Dance Dance Revolution for your finger. It's the second stop on my search for good music games on Android, but it won't be my last. Finger Dance Revolution is just what you'd expect. Arrows fly up the screen and you've got to tap them as they meet the arrows at the top with precise timing to score and nail the dance steps. The graphics are nice and the songs are generally pretty good. One disappointment is that the full $1.99 version has only 8 songs versus its lite (aka free) cousin's 4 and I'm not sure that's enough to warrant a purchase. The graphics are good and the arrows move smoothly to the top of the screen. The touch controls execute well. And while this isn't nearly as satisfying as playing with my feet it is certainly a solid engine for this kind of game. Enter what I perceive as the big problem... the track data. Just like I didn't appreciate the marketing/sales department many years ago I think often we don't appreciate the intricacy of the skill a game level designer has to employ. And without good 'level data' a game can be left in shame. In the case of Finger Dance Revolution I just don't feel like the arrows match up to their songs very well. DDR always made me feel as if I was conducting the music. Repeated patterns in a song had the same dance steps and they were fun to repeat. I'd look forward to a particular song. It was a thing of beauty. Here, I don't feel like the arrows always match the beat of the song very well, and I certainly don't see that there are patterns used for similar musical sequences. Often I'll find myself adjusting to the beat only to realize I'm no longer tapping arrows. And I certainly don't see patterns matching up to the chorus of a song. It's almost as if the steps were randomly generated for each song and while I doubt it's that extreme, and I'm exaggerating this a little I do feel like this is the reason I won't be coming back to the game. Conclusion? It's a shame to see a piece of software where the game engine is expertly developed, but that suffers from weak 'level data'. If you're looking for this style game, and there's no reason not to try out the lite version, then this isn't a horrible choice by any means. Actually it's quite good compared to what I've seen so far. Just not good enough for a 5 star review. I can only hope this gets fixed to make the game a 5 star title. For now it's 3.5 stars. Edit: I'm more than interested in hearing from anyone that disagrees with my assessment of the level data.